My tier point collection ended yesterday, they reset my points and took 585 TP for the year - now, I have 2 flights booked, of which, one next week to make up the 15 TP to secure the 600TP needed to retain my Silver status. have I been retained for silver for another year with 585 points? or will I have to call BA to tell them I took an extra flight for my 2-weeks extension? orbitmic, corporate-wage-slave, dougzz and 1 others like this. If you scroll further down that screen it will say 'collection year ends 8 Feb 2020' and below that 'card expiry' - is that 31 march 2020 (yay!) or 2019 (boo)? 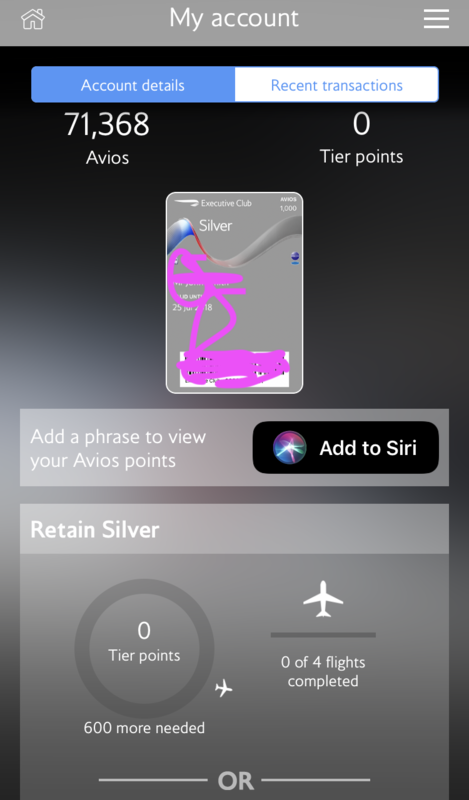 Is that not the mini card thumbnail showing Mr John Smith with only 1,000 avios and an expiry date of 25 July. You get the real personalised card only when you tap on the card and get the fill size version. my tier point collection year ends 08 feb 2020 but card expiry is 2019.
and yes the little card i crossed out is the "john smith one"
Shouldn't be a problem. BA extends a two week grace period.